Today we'll be swatching the entire series of Barry M Dazzle Dusts! And since there are a lot of colours, we'll be doing it in 6 parts. Barry M is, of course, a much-acclaimed UK-based drugstore brand that has fans in the US as well. And their Dazzle Dusts are one of their star products in the brand's lineup, along with their Lip Paints (which, by the way, were swatched and reviewed extensively by yours truly. The roundup post, with links to all the other posts, is HERE). Personally, I really like the Dazzle Dusts, and I can see why they have such a cult following. They're value for money, and a good alternative to MAC pigments - in fact, there are some colours that are pretty similar to some rather popular MAC pigments, like Vanilla Pigment. But it is my experience that although they're cheaper, they don't quite last as long as MAC - after awhile they do fade, but just a tad. But I really don't have anything to complain about, especially given the price. 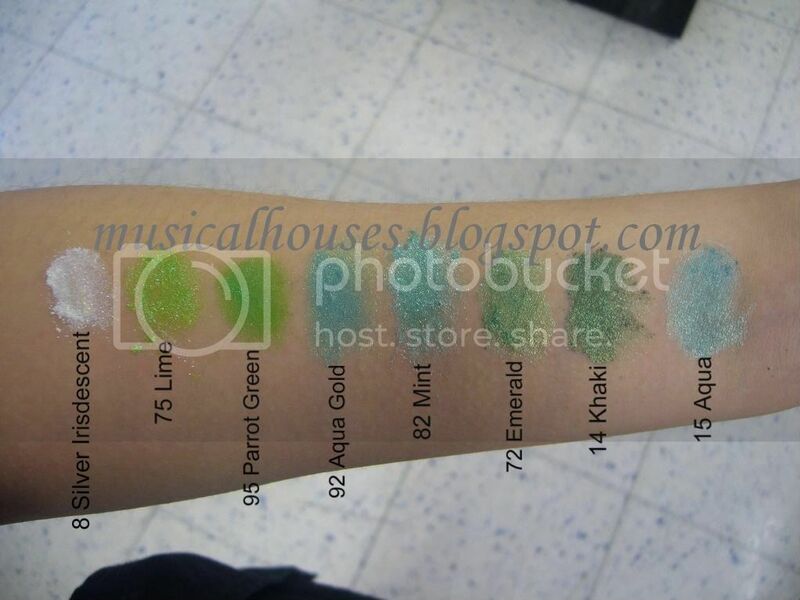 I think this is good as drugstore pigments are ever going to get, and I absolutely love the fact that they have a wide range of colours. There really is something for everyone, whether you like glitter or not, whether you like neutrals or brights...And for ol' boring me, who loves taupes, I'm pleased to report that there are indeed some killer taupes! The Barry M Dazzle Dusts also have a range of finishes. There are few, if any matte ones, so most, if not all, the shades have some form of glitter. The glitter varies, however. In some colours it takes the form of big bits, in some it's more of a fine shimmer, and in others it's a frosty finish. Again, there's something for everyone, as long as you're not glitter or shimmer averse. Silver Irisdescent 8 isn't really silver, or irisdescent. It's more like a white frosty glitter. But I guess White Frost isn't as exciting a name as Silver Irisdescent. Nevertheless, this basic shade will make a good brow highlighter for anyone wanting one, especially for pale girls who feel that all the brow highlight shades tend to fade into their own skin. Lime 75 is a bright lime green with glitter bits. It's a yellowed green, which makes it lean more warm than cool. It's a close relative of Parrot Green 95, but they aren't identical. Parrot Green 95 is another green, and this one actually does kind of remind me of parrots! It's similar to Lime 75, except that Lime has bigger bits of glitter than Parrot Green, and Parrot Green is a bit more green and less yellow than Lime, and just a shade more intense. Aqua Gold 92 is a beautiful turquoise shade with a little bit of gold duochrome. You can see the duochrome effect in the edges of my swatch. The shimmer in this one is also really fine, unlike it's sister shade, Mint 82. Mint 82 has a similar base shade to Aqua Gold 92, but it has much bigger bits of glitter, and no gold duochrome. As you can see in my swatch, the glitter is actually visible to the eye. It's also a bit brighter and less subdued than Aqua Gold 92. Emerald 72 is a beautiful jewelled forest green that does kind of look like what I imagine an emerald might look like. It also has a pretty gold duochrome and a fine shimmer to it. Khaki 14 is Emerald 72's close sister, but they aren't twins. It's darker, more blue-based (and thus cooler toned), and also doesn't have the gold duochrome. It does, however, also have the same fine, slightly frosty shimmer Emerald 72 has. Aqua 15 is a hybrid between Mint 82 and Aqua Gold 92 - it's sort of like the base colour of Mint with the duochrome effect and frosty shimmer of Aqua Gold. Although I have to qualify that the duochrome effect is barely there. Thanks for swatches these! It's gonna take you a while to do them all. I only have 3 dazzle dusts but I love them, very pigmented and go on so easily! just curious, how many of these do u own? Very pretty! I don't often wear greens, but I'd definitely be interested in these. :) Thanks for the swatches! @Jennifer: I own about 2-3 of them, and as you can expect they're all neutrals :P I'm interested in the Sleek pigments also though, but they don't have as wide a range of colours.